The recent incident of mob lynching of two artistes from Guwahati at Panjuri Kachari village under Dokmoka Police Station in Karbi Anglong district, has received widespread condemnations. A number of organisations both in Karbi Anglong and West Karbi Anglong districts have taken out protest rallies against the incident. Kheroni Journalist Association in West Karbi Anglong took out a silent procession in Kheroni in protest against the killing of the two youths, namely Nilotpal Das and Abhijeet Nath on Friday night. At Bakaliaghat Jirpo, an NGO, took out a silent march condemning the killings. While AASU, Bakaliaghat Regional Committee activists lit candles in memory of the deceased Nilotpal and Abhijeet. 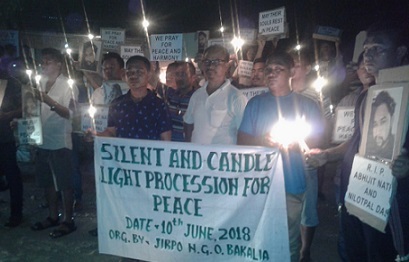 Social organisations in Diphu took out a candle light procession from Diphu Club to Semson Sing Ingti Memorial Park, here on Sunday. Candles were lit in front of photographs of Nilotpal Das and Abhijeet Nath and offered prayers. Diphu Regional Committe of AASU, Simeon Rongphar faction of Karbi Students’ Association, Assam Jatiyabha Yuva Chatra Parishad, Dimasa Students’ Association, All Gorkha Students’ Association, Karbi Anglong; Karbi Women Justice Forum; Karbi Lammet Amei and others took part in the procession. At Karbi Anglong District Congress Committee (KADCC) office, candles were lit to show solidarity with the victims’ families. Likewise, candle light programme was also held at Hanjanglangso by the AASU regional committee there. Karbi Anglong Morning Star Football Academy, Diphu also held a one-minute silent prayer for the departed souls here at Diphu Government College playground. Amidst widespread condemnations 16 people were arrested so far over for being involved in the Panjuri Kachari Gaon incident. The arrested are Biju Basumatary (25), Biswaram Swargiary (22), Dhonda Mech (25), Dhono Mech (45), Dipjyoti Basumatary (26), Horukon Swagiary (20), Pangtheng Basumatary (30), Ram Swargiary (21), Umesh Khaklary (26), Babu Rongpi (20), Anos Timung (49), Sanjay Terang (19), Bidyasing Rongpi (18), Anand Rongpi (19), Raju Bey (19) and Bhupendra Terang (18). Top police officials including the Superintendent of Police, Karbi Anglong, Dr Siva Prasad are camping at Dokmoka Police Station and are monitoring the investigation.